Knowing that existing methods for pathogen diagnostics are time-consuming and expensive, a team of scientists at the Leibniz-Institute of Photonic Technologies (Leibniz-IPHT), the Center for Sepsis Control and Care at the University Hospital Jena, and Friedrich Schiller University (all in Jena, Germany) have developed a lab-on-a-chip system that combines Raman spectroscopy analysis with microfluidic sample processing. With the system, the researchers could clearly identify bacterial strains and their resistances in less than three hours, according to project manager Ute Neugebauer. Standard practices for infectious disease diagnostics require up to 72 hours for a reliable result, as the amount of pathogens in a patient’s sample is too small to conduct tests without the need for time-consuming cultivation. This is a hurdle in treating severe infections such as sepsis, in which time is a crucial factor—therefore, intensive-care physicians often have to administer broad-spectrum antibiotics blindly because they can neither analyze pathogen nor potential resistances, explains Michael Bauer, director of the Clinic of Anesthesiology and Intensive Care at the University Hospital Jena. So, the research team’s method provides much faster diagnosis as basis for selecting reliable therapy. Neugebauer, who works at Leibniz-IPHT and University Hospital Jena, points to tiny electrodes that are fixed on the surface of a stamp-sized chip, which secure bacteria in a very small area. The scientists then apply various antibiotics in different concentrations on the trapped bacteria and examine them with Raman spectroscopy, which involves irradiating the pathogens with laser light and then evaluating the scattered light spectrum, Neugebauer explains. After two hours, the researchers were able to detect distinct changes in the Raman spectra and, out of these, could derive whether the strain is resistant or sensible, explains Jürgen Popp, director of Leibniz-IPHT and head of the Institute of Physical Chemistry at Friedrich-Schiller University Jena. At the same time, they could get information on the needed concentration of the antibiotic to constrain bacterial growth, he adds. 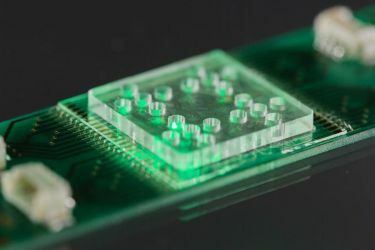 The researchers are currently working on a platform for use in hospitals, and hope to further develop it into a cartridge-based rapid test system that will enable general practitioners to identify antibiotic resistances quickly and easily. This would allow physicians to administer the best drug for patients.